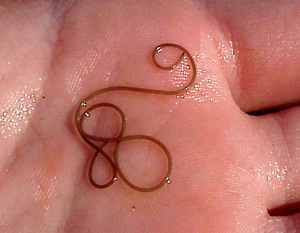 Horsehair worms are similar to nematodes, but are much longer and very thin. They generally reach a size of 4'' and are only 1/80 to 1/10 inches in diameter. They are slow movers and frequently contort their bodies into intricate knots. They develop as parasites inside the bodies of grasshoppers, crickets, cockroaches, and some beetles. In order to lay eggs, they will exit their host. Eggs are layed in water. Water or wet areas as well as cisterns or any other open container with water. Horsehair worms are not parasites of humans or livestock, so there is little effort to control their populations. Their name comes from the old belief that they came from horse hairs that fell in into water and came to life. "Horsehair Worms". University of Kentucky Entomology. Retrieved from: http://www.ca.uky.edu/entomology/entfacts/ef613.asp.